Spina Bifida (SB) is a relatively common birth defect which appears in 1-2 per 1000 live births worldwide. In the United States alone, there are 0.7 cases of spina bifida per 1000 live births. Spina bifida is a neural tube defect that happens during the development of the fetus while in utero. The bones of the spine in a fetus with SB do not close around the spinal cord as they should and remain unfused. Normally the neural tube closes at 3-4 weeks after conception, so this is an early neural tube defect. We have found local resources for those with SB. Those who are looking for state specific SB statistics, clinics, support groups, camps for children, sports and activities and more can click on the map below to find help in your area. The Children’s Hospital of Philadelphia made an excellent video about SB. I highly recommend watching this if you do not know much about Spina Bifida. 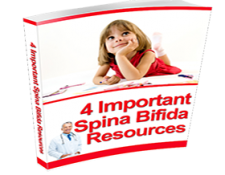 There are three types of spina bifida: occulta, meningocele, and myelomeningocele. Myelomeningocele is the most severe form. In some fetuses, the prior two conditions are very mild and can even be undetected throughout the child’s life. In other fetuses, the conditions are dire and life-altering. If the opening is large, some of the spinal cord will push out through the opening and cause a visible bulge out of the back of the fetus or child. 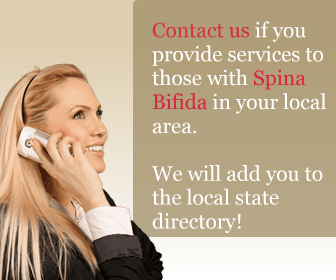 In most cases, the cause of spina bifida is unknown. Some instances of this birth defect are preventable by having the mother-to-be ingest folate supplements, however, studies have shown that up to 30% of the time the condition will still not be prevented. This suggests that spina bifida is a heterogeneous mixture of conditions caused by a variety of developmental factors. Women who have one child with spina bifida are at much higher risk of having another with the same defect, so their pregnancies should be carefully monitored. Babies with very mild spina bifida may not ever be diagnosed until much later in life when they have some sort of spinal imaging such as an X-ray or MRI. For these lucky individuals, a cleft in their spinal column does not cause any major problems or symptoms. Moderate to severe spinal bifida, on the other hand, may need to be treated either immediately after the baby is born or even in utero. A child with this birth defect will need medical treatment their entire lives. Some will not be able to walk properly and will need surgeries to correct the problem as much as possible. Advances in treatment have improved both survival and quality of life for those who suffer from neural tube defects. In the 1960s, babies born with spinal bifida were not expected to live to see their first birthday, whereas today almost all spina bifida patients will live to adulthood. ABC News: Surgery in the Womb May Help With Spina Bifida. A new study finds surgery before birth may be more effective than after. Studies & Research for those with SB. Fill out the form below to receive it today! We will add your organization!